While the House this week approved a budget plan for FY 2014, the Senate continues to debate a starkly different proposal. As the budget process progresses, neither plan is likely to garner bipartisan approval, but the proposals illustrate the differences between the two political parties. 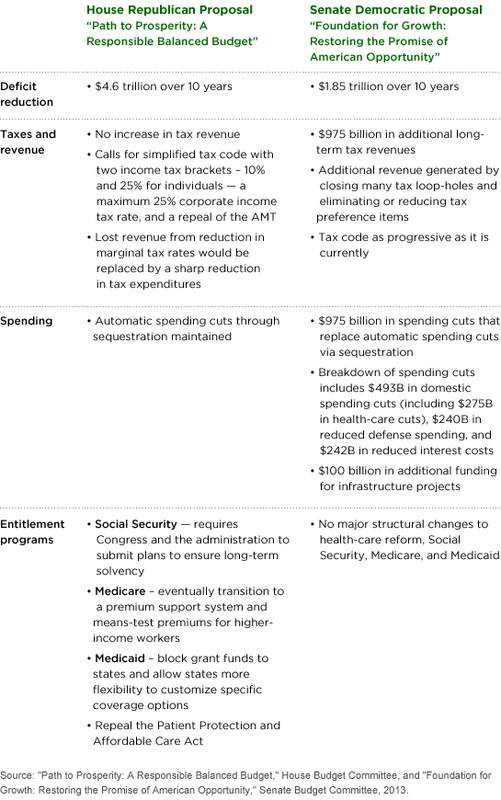 Not surprisingly, long-term deficit reduction is a priority in both proposals, with tax reform and the treatment of entitlement programs topping the list of differences between the two offerings. The Senate is expected to vote on its budget proposal in the next week or so. Typically, the budget process involves more detailed work by congressional finance committees, led by Senate Finance Committee Chairman Max Baucus (D-MT) and House Ways and Means Committee Chairman Dave Camp (R-MI). Potential tax reform as part of this process may result in a more simplified tax code and a reduction in overall tax rates. But investors will also be watching the debate closely for any scale-back or elimination of tax preference items. Beyond the current budget debate, the nation is expected to again reach its debt ceiling of borrowing by early to mid-summer. This event will open up another debate on Capitol Hill around federal spending, and tax reform proposals will again be on the agenda.